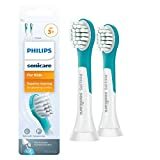 Designed especially for children, Philips Sonicare for Kids toothbrush heads encourages healthy brushing habits and delivers outstanding results. These compact brush heads are designed for smaller mouths and have rubber molding to protect children's sensitive teeth. The soft bristles are designed especially for small teeth and developing gums. The Sonicare for Kids brush heads snap on and off for easy cleaning. For best results, a new brush head is recommended every 3 months. A fresh brush head every 3 months maximizes the effectiveness of Philips’ unique Sonicare technology. Essential Oil Warning: Toothpaste containing essential oils can damage your brush head. Avoid direct contact with products that contain essential oils or coconut oil. Use may result in bristle tufts dislodging.